The equity gap is growing- small businesses worldwide are finding it harder to obtain needed financing, as has been well documented. For some companies, especially those in emerging economies with few resources, the only alternative is to seek funding from wealthy individual ?angel investors? who are willing to invest in seed enterprises that are too risky for venture capitalists. An article in the Economist details the role these angel investors play in funding startup enterprises, especially as they are becoming an effective bridge to expansion stage funding where investment firms are more willing to take over. The story of the finance gap that exists between an enterprise’s startup stage and VC investment is similar to that of the major banks giving microloans; the large fixed costs associated with an investment along with the greater risk of failure small startups have deter VCs from putting money into these enterprises.The typical example of this barrier is the fact that VCs stayed away from Skype in its early stages, but the scenario is even more common among entrepreneurs in developing countries who are less likely to have the credit and family connections to fund their own business model. The Economist article focuses on the ways angel investors are crucial for SME development in the US (where they invest about $30 billion per year), but these networks have even greater relevance in countries where funding from mainstream investors is less accessible. These informal arrangements of small numbers of people willing to invest in budding enterprises with higher risk but equally high profit potential could be the link needed to flood the BOP in emerging economies with capital and change the trend of countries being stuck with only very large or very small busineses. Perhaps some attempts to formally network angel investors are in order, or a system that connects these financiers to promising companies that are operating under the radar? in fact that is exactly what Kiva does. If this model ends up being successful, it would be worth replicating in Mexico or Bangaldesh. By the way, I just read that the wealthiest segments of the Indian population are growing rapidly? 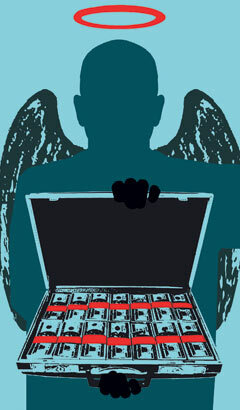 a new pool of angel investors, or just a sign of growing wealth disparities?